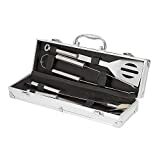 Top quality stainless-steel grilling tools designed to handle all your BBQ needs + 1 Aluminum Case to carry them. Handsome carrying case with dual latches for secure storage – arrive at the cookout, tailgate party or picnic looking like a pro! Product packaging size: 14.9 x 3.9 x 3.1 inch (37 x 10 x 9 cm). Weight: 2.1 pound (1 kg). Great for taking with you to the park, keep in the RV or on the boat, Not just for backyard use. Sturdy utility style BBQ set holds up to heavy, repeated use with same great results every time. Versatile, elegant design armor style aluminum carry case, space saver. Made of heavy duty high grade stainless steel with non slip handles and loops for easy hanging. Tools fit neatly into an aluminum carry case. Nifty gift-ready package for housewarming, wedding, showers, father’s day and more special occasions.